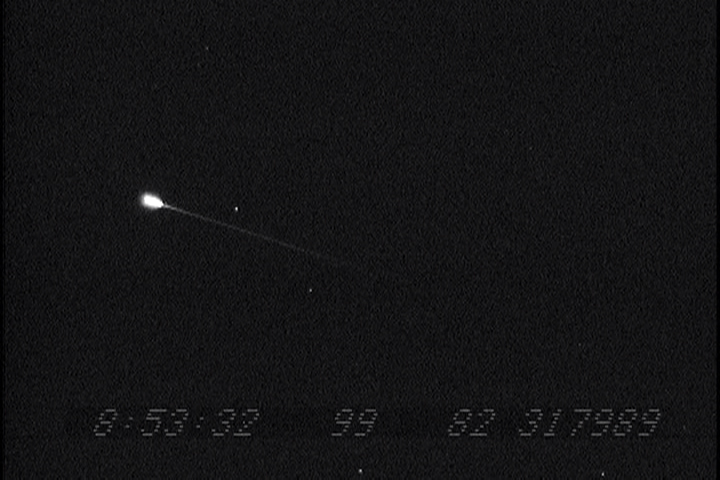 This meteor was tracked across the zenith until it passed out of the wide field camera's FOV. 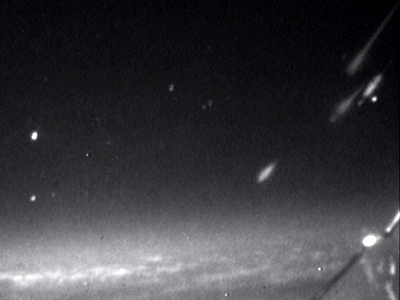 20 Aurigid meteors (video 8.8Mb Mpg) - This video contains some 20 Aurigids imaged between 10:53 and 11:45 UT. Notice how the light from several meteors gets reflected by the airplane wing in the lower right corner of the field of view. 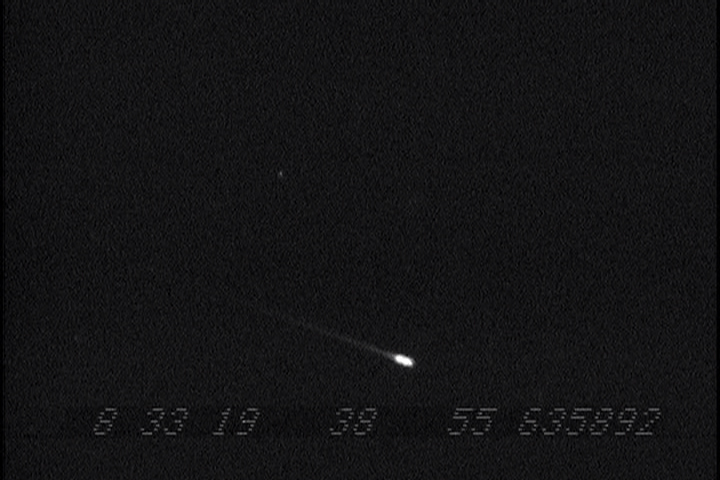 Some preliminary 10 minute counts from the wide field camera starting 10:53 UTC ending 11:53 UTC. FOV=50 degrees wide by 25 degrees high. Times are possibly inaccurate and need to be shifted slightly ahead or back. Well, here is a brief account of the Aurigid MAC mission. I will add more to this including pictures as the next few days go by. Thursday afternoon, August 30, after flying in to San Jose airport from Baltimore Maryland and arriving at the SETI institute, I unwrapped the meteor tracker instrument and video gear that I had shipped via FedEx. Everything arrived intact except the clear plastic bin that held the video gear. The tub was shattered but fortunately, the equipment survived in tact. All was well. I mounted the mirrors, checked the alignment and started mating the spectrograph to the tracker mount. we then attended a general meeting about the flight, took a look at sky maps, flight paths, and got an idea as to the details of the mission. Seeing the various experiments people were preparing was very interesting and it was great to see people I'd met before, and also those that I hadn't. The English and French traded various jokes about each other, they are quite clever and amusing! Later in the afternoon, we headed to AMES Research Center flight line to set up instruments in the airplanes which were both Gulfstream G5s. We later received a safety inspection of sorts and then the plane I was on, went on a two hour test flight to ensure things were indeed up and running with no power issues, glitches or unforeseen anomalies. 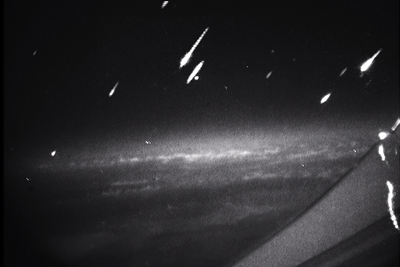 During the flight, there were several small thunderstorms below which were impressive in the image intensified screens. Fortunately we didn't roast anything. Shortly after landing we all headed to the hotel to sleep for the rest of the night. Friday waking up, came really late for me. I was up by 7:00 am California time (10 AM EST) and shattered long duration record or something. I met with a few others that were up early but we were all not really able to (or supposed to) do anything until 7:00 pm at which time we headed back out to the airplanes at AMES, for the event! The agenda was to rest up of the day. We arrived at the AMES flight line just before 7:00 pm and Geoff calibrated his spectrograph with his helper outside the airplane standing on a ladder holding some calibration lights. It was difficult to do this because of all the millions of lights in the background field of view. We took off and shortly after crossing 10,00 ft, started setting up. All gear had to be stowed for takeoff and landing, not only the seat backs. To stow and unpack, we formed somewhat of a human chain to pass the gear forward from the aft storage compartment. It worked well and saved time. After setup and some initial calibrations and tweaking, we took a couple of hours of data surrounding the expected time of the peak. 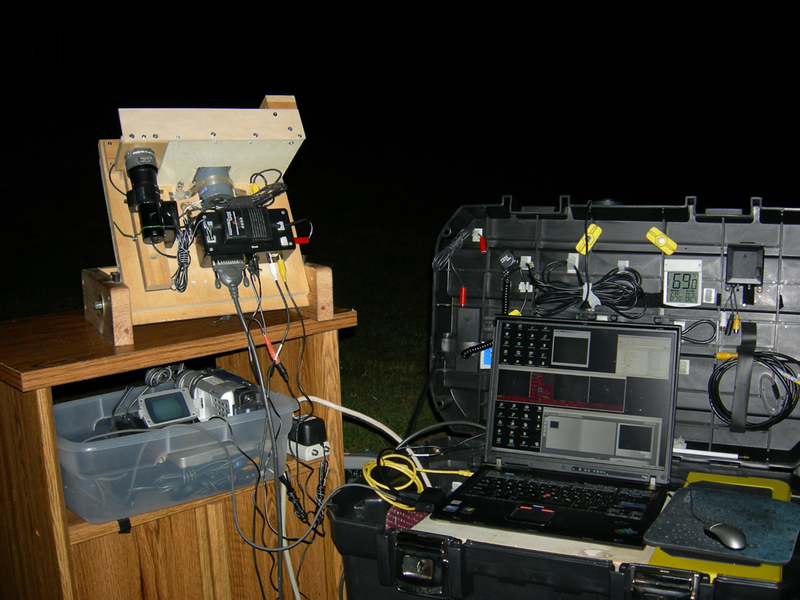 The meteor tracker tracked several meteors with four bright events in one little specific area of the sky in a short period of time. It was exciting to see it on the screen as I never really monitor it in real time; the meteor tracker is automatic and hands off. I do not know if Geoff was able to obtain spectra though. I was unfamiliar with it so had little clue as to what I was seeing in his video screen. I have not yet completed a timed count of the wide field video but hope to do so soon. 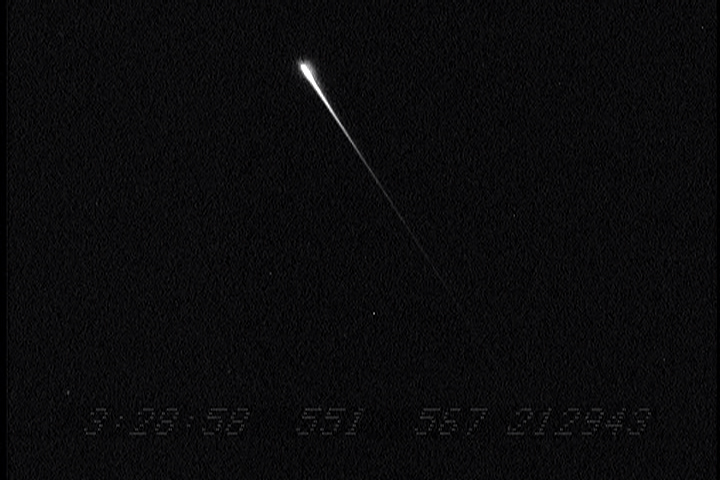 Basically, the AMI-IT meteor tracker was used for data that I did not record. I did record only my wide field camera. I certainly hope all came out well and do not know how long it will take for the results of Geoff's experiment. I thank the American Meteor Society for helping me to participate in this event. Skies were not so good for the peak with thick haze and a limiting magnitude of about 3. Had good skies last night into this morning and the meteors were abundant with several Perseids seen and imaged! I spent too little time focusing the high resolution camera, another lesson learned after the fact. Tracking and stability were good.